The next topic in our look at car audio amplifier specifications is input sensitivity. This specification is easy to understand but is important to choose an amp that will work with the system your local car stereo shop has designed. In the simplest of terms, the sensitivity specification determines how much voltage is required on the input of the amplifier for it to produce full power. Let’s look at it in more detail. 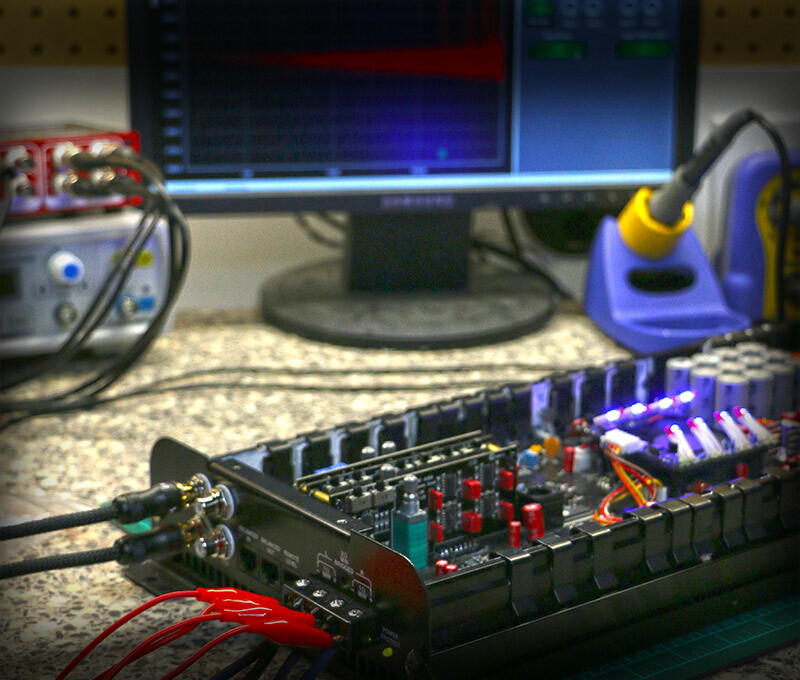 Using our high-quality two-channel amp, our measurement equipment can show us just how much, or little, signal is required to produce a specific signal from the amp. We are going to use an output level of 10 watts for this example to keep our bank of load resistors cool and power supply happy. With the sensitivity controls set to their lowest level, our amplifier produces 10 watts of output (6.32 Vrms) from about 1.4 V of input signal. This ratio equates to a system gain of 12.34 dB. With the sensitivity controls on the amplifier turned to their highest setting, the amp amplifier is capable of producing 10 watts of output (6.32 Vrms) from a mere 54 millivolts rms of signal. This ratio equates to a gain of 41.41 dB. Why Does Amplifier Sensitivity Matter? Being able to get full power from your amplifier from a variety of signal sources is important to ensuring that your installer can make that amp work with any source. If you have a high-quality aftermarket source unit, the preamp outputs should provide 2 or 4 Vrms of signal with the volume at maximum and a recording at 0 dB. If you are trying to power an audio system from something like an iPod, you may find that the signal from the headphone jack peaks around 1 Vrms. I tested one of my iPod Nanos at 1.03 Vrms. This lower maximum level means you need more gain from your amplifier. At the other end of the scale, you may want your installer to connect your amplifier to the speaker outputs of your factory radio or factory-installed amplifier. The voltage from these sources may be as much as 8 V from a radio and could be as high as 40 V from a high-powered factory subwoofer amp. In those cases, you need to choose an amp that has dedicated speaker-level inputs or implement some sort of level converter to reduce the signal to something that the amp can accept. When it comes to having a fully active audio system installed in your vehicle, unless you choose to implement a stand-alone digital signal processor (DSP), you will want to choose an amp with a lot of adjustability so that your installer can use the sensitivity control to reduce the output of the amp for the tweeters and midrange speakers, relative to the subwoofers and mid-bass drivers. You may find it useful to choose an amp for your tweeters that doesn’t produce a lot of power. Less maximum power output capability will reduce the amount of gain designed into the amp and result in a system that is easy to balance. We would strongly recommend using a DSP since it enables you to configure crossover and output level adjustments quickly, but we understand that every audio system upgrade has budget limits. You can always upgrade later. If you have understood this article fully, then you realize that more signal from your source unit doesn’t necessarily represent an ability for your amplifier to produce more power, assuming the input sensitivity control is adjusted properly. Years ago, when aftermarket source units with high-voltage preamp outputs were introduced, some companies marketed them as allowing stereo systems to play louder. If you didn’t adjust the sensitivity controls on your amp, this was a true statement. The real benefit of a strong preamp signal is that you can turn down the gains on your amp and subsequently reduce the background noise in your system. Look at the difference in background noise of our high-end audio amp with the gain set at minimum and at maximum. Not all amps perform this well. As long as you can get full power from your amp, less gain means less background noise. In most cases, the name-brand amplifiers available on the market today have the input voltage flexibility required to work in almost any application. Your local mobile enhancement retailer would be happy to work with you to pick a solution that will maximize the performance of your system.